Il Trovatore, Act II: Gypsy Chorus -"Vedi! Le Fosche Notturne"
Carmen, Act I: Habanera -"L'amour est un Oiseau Rebelle"
La Traviata, Act I: Brindisi -"Libiamo ne' lieti Calici"
Faust, Act II: Méphistophéles Rondo -"Le Veau d'or"
Tannhäuser, WWV 70, Act II: Entrance of the Guests at Wartburg -"Freudig Begrüßen wir die Edle Halle"
I Pagliacci, Act I, Scene I: Bell Chorus -"I zampognari"
Rigoletto, Act III: Duca's Aria -"La Donna e Mobile"
Lucia di Lammermoor, Act II: Choir of the Guests -"Per te d'immenso Giubilo"
Carmen, Act II: Torrero Song -"Votre Toast"
Don Carlos, Act II: Duet Rodrigo & Carlo -"È Lui! Desso! L'infante"
I Puritani, Act II: Chorus -"Ah Dolor! Ah Terror"
Tannhäuser, Act III: Pilgrims Choir - "Beglückt darf nun dich, o Heimat, ich Schauen"
The Merry Wives of Windsor, Act III: Fairy's Choir -"Ihr Elfen Weiß"
Der Freischütz, Act III: Huntsmen's Chorus - "Was gleicht wohl auf Erden"
Mlada, Act II: Cortège - "Procession of the Nobles"
Les Pecheurs de Perles, Act I: Duet Nadir & Zurga - "Au fond du Temple Saint"
Faust, Act I: Chorus -"Vien ou Bière"
Aida, Act I: Aida's Aria -"Ritorna Vincitor"
The Barber of Sevile, Act II: No. 15,"Thunderstorm Music"
Mefistofele: Prologue & Chorus -"Salve Regina!" Manon Lescaut, Act I: Des Grieux's Aria -"Donna non vidi Mai"
La Forza del Destino, Act II: Chorus - "Rataplan, Rataplan"
Il Trovatore, Act III: Manrico's Stretta - "Di quella Pira"
Don Pasquale, Act III: Chorus of the Servants -"Che Interminabile Andirivieni"
Otello, Act II: Jago's Aria -"Credo in un dio Crudel"
Turandot, Act I: Chorus - "Gira la Cote"
I Vespri Siciliani, Act V: Elena's Siciliana - "Mercè, Dilette Amiche"
Norma, Act II: Chorus -"Squilla il Bronzo del Dio"
Nabucco, Act I: Chorus -"Gli Arredi Festivi"
The Flying Dutchman, WWV 63, Act II: Sailors' Choir -"Steuermann, lass die Wacht"
Boris Godunov: Prologue -"Coronation Scene"
Boris Godunov, Act IV: Finale -"Boris's Death"
The Rhine Gold, WWV 63a: Final -"Entry of the Gods At Walhall"
Macbeth, Act I: Coro d'introduzione & Chorus of the Witches -"Che Faceste"
Lucia di Lammermoor, Act III: Choir of the Guests -"D'immenso Giubilo s'innalzi un Grido"
Madama Butterfly: Finale & Butterfly's Death -"Con Onor Muore"
Ernani, Act I: Chorus - "Evviva - Beviam!" 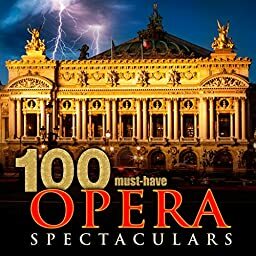 The Barber of Sevile, Act I: Figaro's Aria -"Largo al Factotum"
Tosca, Act I: Cavaradossi's Scene & Aria -"Recondita Armonia"
Don Carlos, Act III: Gran Finale -"Spuntato Ecco il di d'esultanza"
Lakmé, Act II: Aria -"Ou va la Jeune Indoue"
Roméo et Juliette, Act I: Juliette's Aria - "Je Veux Vivre"
Les Troyens, Act V: Dido's Aria -"Je vais mourir Adieu, Fière Cite"
Lohengrin, Act III: Prelude and Bride Chorus -"Treulich Geführt"
Attila, Prologue: Duet Attila & Ezio -"Tardo Per Gli Anni"
Il Trovatore, Act III: Coro d'Introduzione - "Or Co'dadi, ma fra Poco"
Macbeth, Act III: The Witches Spell and Chorus -"Tre Volte Miagola la Gatta"
Don Pasquale, Act II: Ernesto's Aria -"Povero Ernesto!" Aida, Act II: Triumphal March and Chorus -"Gloria All'Egitto"
Siegfried, Act I: Siegfried's Scene with Mime -"Hoho! Hoho! Hohei!" Parsifal, Act III: Chorus of the Knights -"Geleiten Wir"
The Valkyrie: Wotan's Farewell and Magic Fire Music -"Leb wohl du Kühnes herrliches Kind"